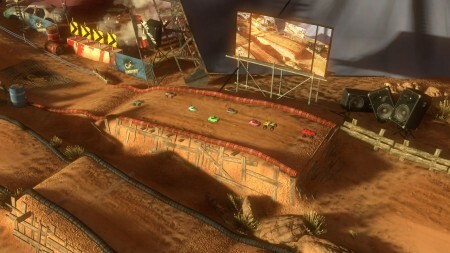 Evolution Studios’ Motorstorm series just seems to keep getting better and better. The last outing on the PS3, Motorstorm Apocalypse, was a rip-roaring off roader with stunning speed and graphics that finally made me love the franchise. Now the team are back as part of the Vita launch line-up and they’ve taken a neat risk with the series. Opting to ditch the previous games traditional first person off-road slug fest and instead building a spiritual successor to classics like Ivan “Ironman” Stewart’s Super Off Road, Micro Machines and Super Skidmarks. So what do you get for under £5? Well you get a fun and feature packed isometric/top-down racer with some neat online features; that’s what! Many may be put off by the fact that Evolution have not gone down the traditional racer route here. Let’s think for a moment though. If they had gone that route then we’d be looking at a retail title that may, or may not, have hit launch. Comparisons to the fuller featured titles would have to be made and, despite the raw power of the Vita, that would have been so unfair. Instead Evolution have been smart about the whole proceedings. Here instead we are given mini Remote Control (RC dontcha know!) editions of the more well known vehicles. Then we’re offered two simple mechanics for controlling them. Either rotational or directional steering with the left stick. Whichever method you choose you’ll use the right analogue as the accelerate and brake.. and apart from R to reset a crashed vehicle that’s it. Simple, clean, pure. You take your rally car, monster truck, or big rig across a series of levels based on the previous titles. 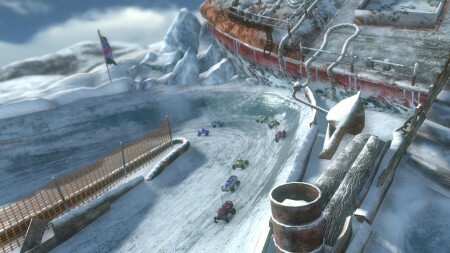 From the MotorStorm Monument Valley, MotorStorm Pacific Rift, MotorStorm Arctic Edge and MotorStorm Apocalypse series. Each area has a series of levels designed to have you racing against AI opponents, against the clock or in a bid to overtake a certain number of cars in a certain time limit. Completing each of these races awards you with one, two or three medals depending on your performance. The more medals you have then the more levels, vehicles and items are unlocked for you. Also at the end of each level comes the genius master stroke that keeps you coming back – the leader boards. After each race you’re presented with the top scores of friends to compare your times against. Much like Trials HD and so many other titles you just have to give it one more try to beat their score. This adds greatly to the games longevity which, even without that element, would be substantial for a download only title. Graphically the game doesn’t even try to compete with the PS3 titles. Instead you have tracks of varying materials – dirty, sand, tarmac, ice, snow etc. Each representing a different and challenging driving conditions. Vehicle models are clean and clear and tracks are well created and the whole thing moves at a great pace. Menus are suitably slick and clearly presented and work well with the touch interface. The only design niggle I have is that the camera never truly feels comfortable in any of its modes. You can change between a fixed, dynamic, off-centre and aerial camera. The game looks at its best when you use the dynamic camera but I found this left far too little of the course exposed for me to comfortably navigate at speed. I mainly used the aerial mode but at times needed to switch to a closer view as parts of the track blended with the background, track object or upper sections of a course. Sound wise the game is well catered for with plenty of the trademark music that the series has been known for. A little less on the bombastic side this time, opting more for an arcade feel to the soundtrack. Car and track noises are all great, as are the in-menu spot effects. As mentioned longevity for even the most basic play through of the 40+ races will be very good. Add to this the scoreboard action and it takes on a life well beyond those as well. The 16 different tracks that are played out over these 40+ races might become a little overly familiar towards the end of play. That said you need to obtain familiarity with these tracks to take down some of those more impressive scores. Niggles other than the camera and slight repetition are pretty minimal. The AI seems a little dumb at times and boy can it cheat at some points. There is also a multi coloured series of dynamic lines that show you the score or time that you are chasing. These are a great way to see how your betters are laying down such awesome scores. The down side being that these can really distract you and blur your path at times. The online and offline features are superbly integrated and keep you retying race after race to beat a friend’s time. No actual online direct play is a little disappointing but only slightly when you consider how well the online scoreboard is integrated. Scores are from PS3 and Vita users alike which is a great addition – did I tell you that you also get the PS3 version free when you buy the Vita one? All for UNDER £5…. why have you not purchased this yet? A few camera, repetition and level design issues aside the game will prove a long term player in anybody’s Vita. Anyone who enjoyed any of the classic inspirations that Motorstorm RC was based on will lap (pun intended – sorry!) this up. When it comes to online titles this, along with Super Stardust Delta, has to be an essential purchase for early adopters of the Vita and represents incredible value for money. Oh and it’s bloody great fun too! And addictive… did I mention how addictive it is… probably not as I’m half playing it whilst typing.